Imagine all you do in your life is to walk the streets of some great cities and take pictures. No assignments, just shoot what you like … and sell it. I guess this is the dream of quite a few street photographers, yet unluckily, I doubt there is a single one out there being able to live off exclusively from street photography. I started selling pictures about a year ago. I am not a pro photographer, yet when I realized there was some demand for my pictures, I started educating myself on the subject. And since then, I have taken steps to grow this revenue stream. But make no mistake, I am still very far from reaching the status of being a full time street photographer. Though the first results are encouraging, I have sold 4 pictures for an amount of $6’000 over the last 12 months with no proactive actions, there is still a long way to make it a steady and significant revenue stream. In the sharing spirit of this website, here are a few thoughts on my experience selling photographs. This is still work in progress as I am still learning, yet I thought it could helpful for some of you that are also looking to market their street photographs. Part I of this article will focus on the basics of selling pictures while Part II will zoom in on a few tentative “how to” tips. 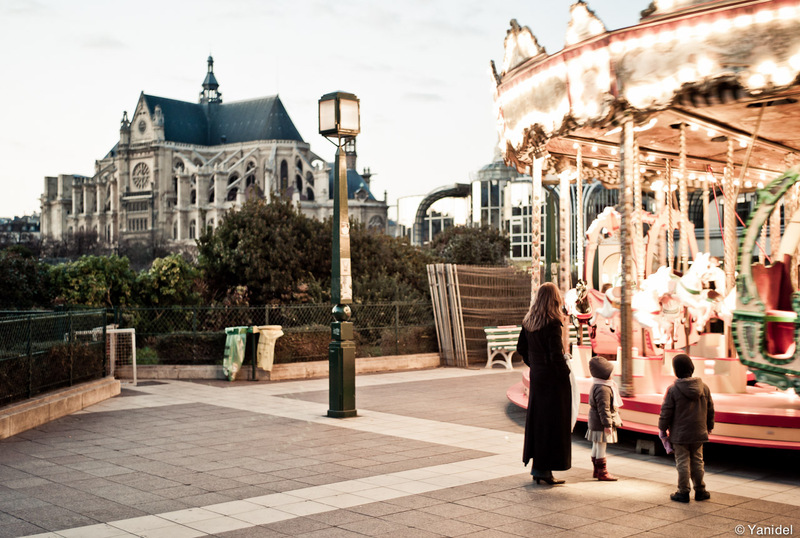 Taken in Les Halles, I sold this picture to Canadian agency for a online touristic magazine. Who buys street pictures ? Of the pictures I have sold or quoted, a large majority of my contacts were art directors of ad agencies. After that, came press editors, both from the paper and online press. Finally, I did get some less usual requests such as calendars or posters from companies or PR agencies. Note that I get very few requests for fine arts prints and though I sell a book through this website, quantities have not been significant. In terms of geography, the demand comes basically from worldwide. So far, I have sold picture to clients located in France, Germany, Canada and Hungary yet I got many requests from buyers located in cities such as LA, New York, Hong Kong or Tokyo. Why is there interest in street photographs ? I like to define street photography as documenting the little daily facts of life. You can find all kind of pictures on micro stocks and the art director’s imagination is the limit when they hire a photographer for a shoot. Yet life in the streets can be sometimes very surprising and an amazing source of inspiration. It is another creative stream for art editors to choose from. Some situations are so spontaneous and special that they either cannot be recreated in staged shootings, or it would simply be expensive to do so. And finally, a street photograph is a true moment of life; it brings authenticity to the subjects, they are no paid actors. 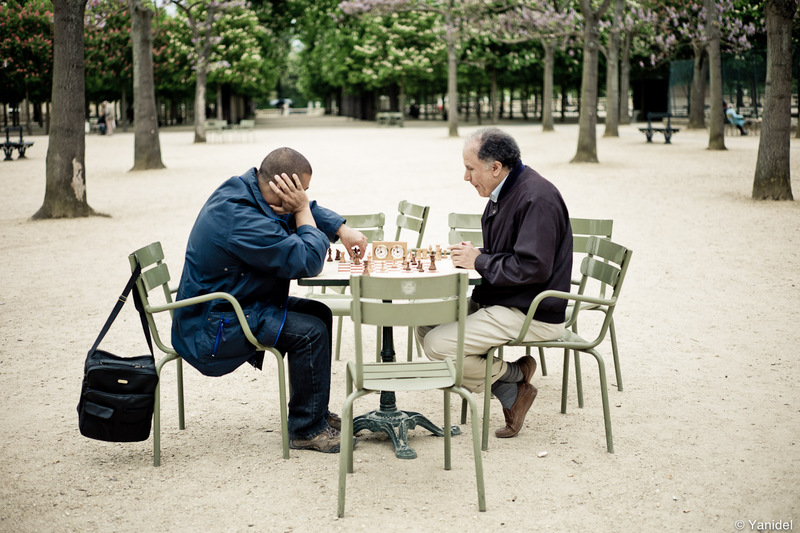 Two chess players in the Luxemburg Garden. A classic whose rights were bought for a Hungarian magazine. What kind of pictures sell ? If you refer to the 5 popular types of street photography article I wrote a few days ago, I think it is clearly the classic street photography type that sells the most. Of the pictures I have sold and quoted, all had simple subjects and compositions. I would add that all were in general aesthetically pleasing and were constructed following basic composition rules. Nothing fancy, nothing sophisticated, just simple life in the streets. All the pictures I sold were taken in Paris. Obviously, shooting in Paris helps a lot, especially for your portfolio exposure, yet the fact is that most of the pictures I sold could have been taken in any European city. How do clients find my work ? All the contacts basically came through my websites. Evidenlty, search engines ranking is key. Because of my posting of daily pictures on my “Street Photography in Paris” blog, entering key words such as “photography Paris” or “Street photography Paris” in Google now yields a first or second page appearance. This evidently helps traffic a lot, and so does having your pictures being re-diffused by other websites such as Tumblr. 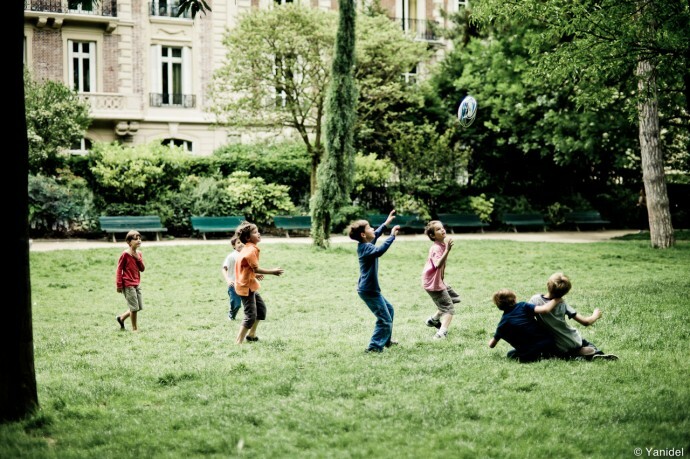 A group of kids playing rugby in the Monceau Park. It was used for a French governmental ad campaign. … is that you do not have model releases in 99% of the cases. Indeed, I don’t know of many street photographers that actually ask for model releases after every single shot. There are two reasons for that : first I personally don’t like to stop my flow when I shoot. Asking for a model release takes a long time, this is all time you do not spend shooting. Secondly, most people would not agree to sign it, unless you spend a long time on the spot, and by email afterwards to convince them. Model releases are important because you’ll need them whenever people are easily recognizable in your pictures. Clients do not always request them but I have lost many sale opportunities because I did not have a model release. Year 2 is off to a strong start since I am working on several interesting sales. Also, I was invited last month to join Getty Images through Flickr. So far, five of my street photographs have been put up to sale through them (out of about 20 selected, I did not have a model release for most of them). Selling through Getty has advantages and disadvantages. On one side your work gets exposed to a lot more audience, but on the other one you only get about 20-30% of the licence fees. It will take me some months to see some results and assess the performance of this channel vs selling directly. As for the remainder of my portfolio, I have spend a huge amount of time going through my archive and selecting the work I think can sell. Indeed, out of my 4’000 pictures, I believe that most of them are either lousy or not interesting. In the end, it is much better to show only my best work rather than having clients go through thousands of worthless pictures. Therefore, I made a short selection of about 200 pictures to be featured in a portfolio that I will soon post them both on Flickr and my website. Finally, I’d also like to start fine arts prints. This is currently not compatible with my status of globetrotter but I’ll definitely look more into it once we settle back in some place. 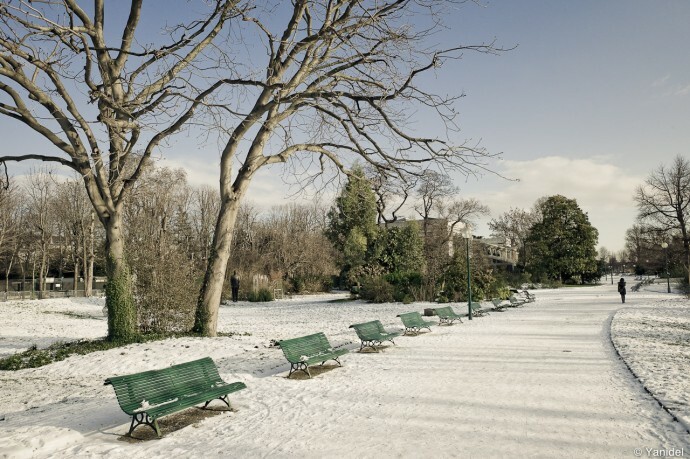 A simple view of the Champs-Elysées park that was sold for a Europe wide ad campaign. Selling street photographs is definitely not easy, but it is feasible. It does take a lot of time (shooting) and dedication (showing your work). My year 1 experience has motivated me to pursue further this opportunity. I doubt I’ll ever be a full time street photographer, yet if I can get some good revenue to finance my passion, it will just be fine with me. Stay tuned for part II on this topic of selling street photographs. In the next article, I’ll go more extensively in the operational details of marketing and selling your pictures.